At some point, your game is going to crash or something you're eventing or programming isn't going to go your way. It's bound to happen and it is part of the learning process in Pokémon Essentials. Do not be discouraged - someone might be able to help you figure out the issue. Do keep in mind this is the Pokémon Essentials section, not a resource request section. Please do not make threads asking other users to do things for you. If you must, use the Team Recruitment sub-forum to find people interested in collaborating with you. You should be attempting to get things done yourself, and ask for help when you're stuck. If you need to accomplish something that sounds astoundingly complex, but you have no knowledge in that field, the first thing you should be doing is research. Asking for help without doing your own bit of research should not be the first thing to come to your mind. 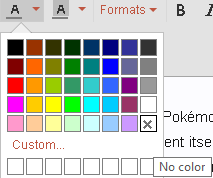 The Pokémon Essentials Wiki is an incredible site full of valuable information. Make use of it! Be sure to take a look at the BB Code help site to learn how to get the most out of your formatting! Was it all working well before, but suddenly it's not? What changed? Did you install a new script, or modify an existing one? Have you started a new save file? Have you deleted a map? Has it never been working? Ask yourself every question possible, because every bit of information matters when troubleshooting. For the most basic of problems that involve scripts, you should try using a clean copy of Essentials. Say your game crashes when a battle starts, for no reason. And you haven't touched the battle scripts at all. Try it in a clean copy. Do battles there work? Sure they do! Then backtrack, and go little by little, adding your scripts/custom PBS edits/etc, until you find the culprit. It's most likely a new script that broke it, or your script call's syntax. Pokémon Essentials version: Bugs are fixed from update to update, and that might also very rarely lead to no backwards compatibility in the way some script calls or older scripts work. Make sure to always use the latest version of Pokémon Essentials, and specify which one is it. Error Log: If the game crashes, Pokémon Essentials raises a window with an error log containing very valuable information. Copy it's contents with CTRL+C. Most of the time, reading into it might you give some clues of what's up, even if you don't understand Pokémon Essentials' code, so don't just copy it, but attempt to understand it. What does your event or script look like? Say you're trying to add a Pokémon to the Player's party, but you're getting an error log, or maybe not even a crash, and the event itself simply does nothing. Use an image hosting such as imgur.com and post images of what the event and all of it's pages look like. If it's not an event, but an entire script inside the Script Editor that you're messing/have messed with at some point, copy the entire section, and either use the BBCode for code...or upload it into a site such as pastebin.com so that others can read your changes. Any scripts or packs you've installed: Elite Battle System, a Generation 6 or 7 PBS patch... Everything matters. Good for you! However, whatever the fix was, please let everyone else in the thread now, and explain the fix to your issue, so that others may figure a similar problem out in the future, and mark your thread as solved. Thread TItle: "My game crashes immediately after pressing New Game"
Description: "(Image) This is the map in which the Player starts. The default Essentials intro map works, but it doesn't work when I make the Player start in my new map. I'm using the latest version of Essentials as well! (Error Log) This is the error log that I get when this happens." Thread Title: "My encounter modifier does nothing"
Description: "No errorlog because my game isn't crashing. (Code) This is what my encounter modifier script looks like, but it's not editing the Pokémon properly and instead does nothing! (Image) These are the pages of the event." A formatting tip: Do not use colours in the body of your thread, as some of our forum themes might be too similar to the colour you've chosen, making it impossible to read. The forum themes will change it's colour on it's own to make sure it's always readable. If you want to undo colour changes, select your text and go to this option, then click the white square on the bottom right, the one with the X. Following the previous #1 thread example, with the game crashing immediately after pressing New Game, or the player being invisible and then crashing after a Map Transfer/opening the pause menu etc, the problem lies in not initializing the Player. You MUST go through the intro in the example map. In the Intro map, there are two events. The top-left one is set to Autorrun. You can set that to something else, and use the bottom-left one as Autorrun, for a quick initialization, naming the player "Red" by default. Read more here. ***Line 'something' shouldn't begin with '('. If your script call doesn't fit into one line, you should use "extendtext.exe", located at the root of your Essentials project folder. If it doesn't work, try admin permissions, or a different compatibility settings in the file's properties. Alternatively, if you know how the syntax works, you can break the line and have it continue in the next. Ideally, the line in the script call will continue after an argument, followed by a comma "," or parenthesis "(" as the script requires. For example, if Kernel.pbAddPokemon(:FLETCHINDER) happened to be too long, you could break the line at the first parenthesis, leaving the two dots and Pokémon name for the next. Similarly, a script such as pbSet(x,y) can also break it's first line after "x," leaving "y)" in the next one.